Titan HD Power Rack Reviewed - Includes Video! I’ve seen similar spec racks costing close to twice as much as the Titan HD power rack, we don’t know quite how they produce these top quality heavy duty racks for under $500 but they do and who’s complaining? Westside hole spacing, 2″x 3″ 11 gauge commercial standard frame with a huge 1000lb weight capacity has to be enough for you to take this rack seriously. It’s tough to find a commercially rated power rack for such a low price, ok there’s no lat attachment available right now for the HD, but Titan says they’re working on it and should be out soon. 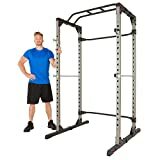 The HD really does offer a lot of bang for your buck, to be able to buy a rack with the Westside hole pattern and the commercially-rated 2″ x 3 ” 11 gauge steel tubing is rare at this price point, couple this with a 1000lb weight capacity and you have one affordable beast of a rack for your home gym. This is the 91″ full height version of Titan Fitness HD range, measuring around 7.5 in feet, you will need about 10-12″ headroom above the pull-up bar for performing pull-ups, this means you’re going to need a ceiling height of over 8 foot. Make sure to measure well before buying this rack, other than the height, the rack doesn’t have a particularly large footprint. One thing many of us forget to take into account when measuring out for a power rack is, someday you might want to move the rack to a different part of the house. There’s been many a weightlifter who chose to train in the garage and for whatever reason wanted to move inside the house, only to realize the ceiling height is too low for the rack, leaving them the only option of having to pay out for another shorter rack. It can be a good idea to opt for a rack that will fit into a few locations. Consider head clearance over and above the rack for standing presses and chinning. 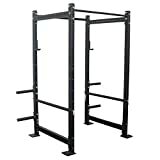 The Titan Hd is built from 2″ x 3″ 11 gauge steel and this is just what we are looking for when we buy a rack for our home gyms. 11 gauge 2″ x 3″ is industry standard for commercial racks and if we can get hold of a rack with this heavy gauge steel tubing for home use for around the $500 mark then we’ll know we’re doing really well. Heavy gauged racks like the HD normally ensure better stability and higher weight capacities and that’s just what’s on offer here, a 1100lb weight capacity means there will be no outgrowing this beast any time soon. 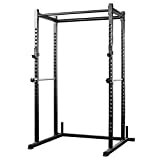 2″ x 3 ” 11 gauge is going to weigh some, and in general, the empty weight of any power rack provides a big clue to the stability and overall build quality of the racks. The HD is nice and heavy at 230lb keeping this thing stable, 4 flat feet one on each corner of the rack come with predrilled holes, just in case you want even more stability, you can bolt this HD rack down to the floor, recommended if you do a lot of out of rack work. The HD has the gold standard of hole spacing, the WestSide spacing, with 21 holes in total, big thumbs up here and again just what we want from our power racks, hole spacing is measured from the centre of the two adjacent holes on the uprights. Hole spacing can affect our reach and range of motion, we see good racks with two-inch spacing and top end racks with 1-1.5 WestSide spacing, so typically the closer the holes the better quality the rack and normally the higher in price but here you’re getting WestSide spacing for an affordable price! On the negative this rack does not come with pre-numbered posts, it saves a lot of time having numbered holes. Because we change exercises constantly, counting for the correct holes on each upright becomes a pain but it’s no biggy to sort, you can just write them on with a permanent marker or some paint. The Titan HD has a 1000lb weight capacity on the spotter bars, this is more than enough for nearly everyone apart from a few very seasoned weightlifters, there’s a lot of racks, cheaply built racks, out there that promise high capacities and can’t back them up, but because the HD is built and designed from heavy duty commercially rated steel, this tank of a rack is going to take it and then some. Even if this is your first rack and you lift nowhere near that sort of weight, it’s good to buy a rack that has a high weight capacity, you’ll be surprised how quickly your strength improves over time. Buy a rack you can grow with. The depth of a rack determines how much forward and backward space you have for bar travel, if you’re a powerlifter the depth is not so important because the bar travels in a straight line for deadlifts, squats, pressed etc, however for the majority of us who lift weights “bodybuilders” who perform exercises with arc-based movements such as curls and extensions the rack depth is a crucial part of our training. A minimum of 23″ is recommended, the HD has a 24″ pillar to pillar depth so box ticked for depth, there is also a deep version available of the HD which we will look at at the end of this review which has 36″ depth. The Titan HD T3 rack comes with weight plate holders which are great for both keeping the weights out of the way off the floor and easily accessible to the bar on the rack, J hooks are also supplied with the HD. The HD includes two chin-up bars, a 1.25″ bar at the front of the rack and a 2″ oversized bar at the rear of the rack, the 2″ bar is awesome for increasing grip strength and giving the forearms an extra workout. The HD range has two dip bar sets available, this is probably one of the most useful attachments you can buy for your HD rack, dips are excellent for lower pec development, I find they add mass much quicker than decline presses, they also give the shoulders and triceps a good workout. Titan also offers a pair of 7 gauge steel heavy-duty spotter arms for the HD rack, HD Spotter Arms easily attach to your Titan HD Power Rack, with 2x3″ tubes that feature 1″ holes at any height. As touched on earlier there is a deep version for this rack, called the HD 36″ deep, this will give you an extra 12 inside the rack between the upright posts, that’s a fair bit of extra room and if you have the extra space to house a larger rack then I’d highly recommend you check out the deep version, everything else on the rack is exactly the same as the HD we have just reviewed apart from depth, so if you need some extra room for arc movements and extensions then you might want to consider paying the extra $40. Summary Maybe the best power rack you are going to find under $500, a durable 1000lb beast for your home gym, everything a Rogue rack is known for, but at half the cost. I can't see anyone being disappointed with the T3 HD, WestSide hole pattern, 1000lb capacity heavy gauged commercially rated frame what more do you need? Top stuff from Titan, affordable gym gear that doesn't cut on quality!